I have a distinct memory of walking down the Boardwalk in Atlantic City as a kid, thrilled by the sight of Mr. Peanut strolling the boardwalk, a beacon to the nearby location of roasting peanuts. 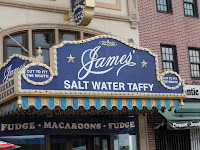 He no longer visits, but memories of him hung with me as I wandered the Atlantic City boardwalk recently. Even though the boardwalk held very little from those years, it welcomed me with its grittiness, rolling waves of the Atlantic Ocean, and endless possibilities for amusement. 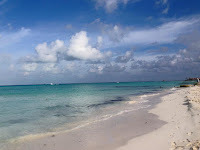 In two quick days, I walked and walked despite the heat, sampling amusement and eats from early morning to late evening. The gritty can be found in the slumped homeless, scattered lightly on the boardwalk. One morning we found an old woman in a wheelchair, hunched over, hoping this signified a deep sleep rather than an early expiration. The previous evening she could be found awake, hanging out in the wheelchair outside a casino. Further down the boardwalk, a wailing woman held church on her own bench in front of the ocean, a bible and collection box to her side, belting Kumbaya and other spirituals for anyone passing by. Occasionally, some would be moved and give her some change, always eliciting a "god bless you" pause in the spiritual. 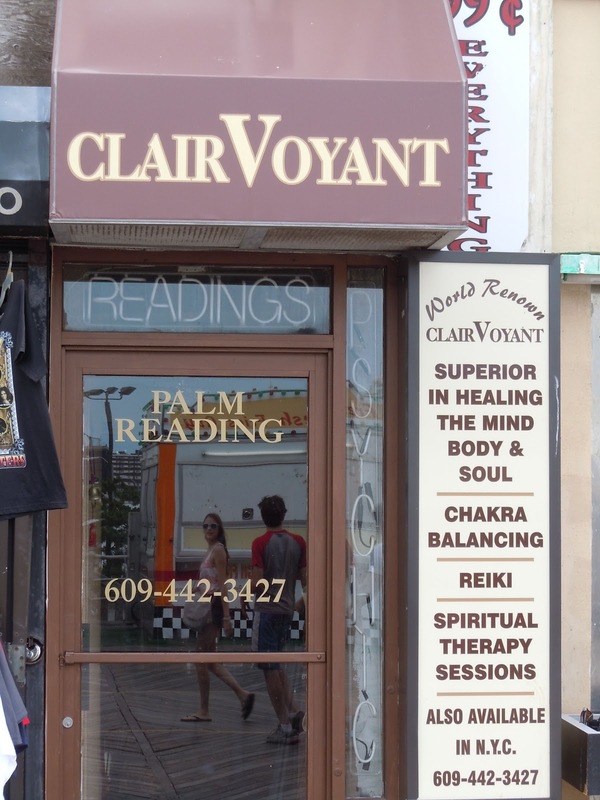 The gritty could also be found in the psychic parlors along the boardwalk. 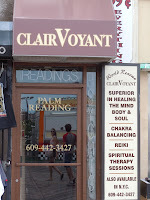 Everywhere I walked, a psychic offered readings for only $5. The first evening, I simply looked in at the assortment of offerings, women in back booths, a hidden mystique promising deep revelations for little money. Feeling overwhelmed by all the choices, I deferred to the next day, when late morning didn't hold lots of open places. Quickly, I entered one of these places (not the one pictured in the photo), looking around until a distracted woman, probably in her early 20s, emerged from behind curtains, texting away on her phone. This should have been a sign to leave, based on her disinterest, but I had entered and was determined to give away a bit of money. Since $5 only got me a character analysis but $10 got me a palm reading, I chose the latter. 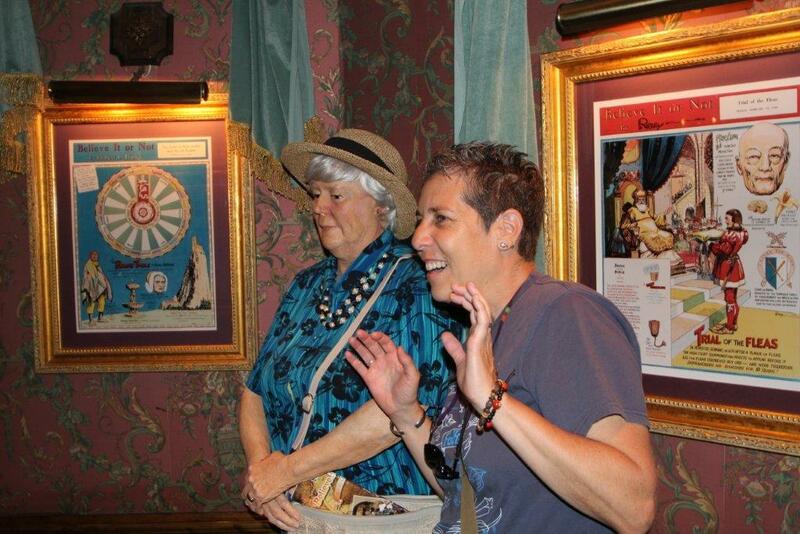 We sat in a small booth, while Nan hovered nearby to listen and watch the psychic perform her magic. The psychic asked me to make two wishes and then instructed me to tell her one. "Do I have to tell you one," I asked, concerned that uttering a wish aloud to someone would curse it from happening (superstitious me). For a moment, I considered telling her one that I hadn't thought, but again my inner neurotic believed that the utterance of a lie would destroy any possibility of truth and goodness. So, reluctantly, I told her one wish. She then asked to see my palm, but looked at it with the same disinterest I had viewed initially in her gaze, telling me such generalities as I would live a long life and die from old age. After several minutes, it became clear to me that I had given my $10 to a drug addled psychic whose intuitive sense and spiritual channeling needed years of lessons in order to appear even remotely authentic. When she told me that we could go deeper, but it would cost more money, I simply said, "No thanks," and took my leave, feeling as though I had sampled a bit of the grit of the boardwalk. 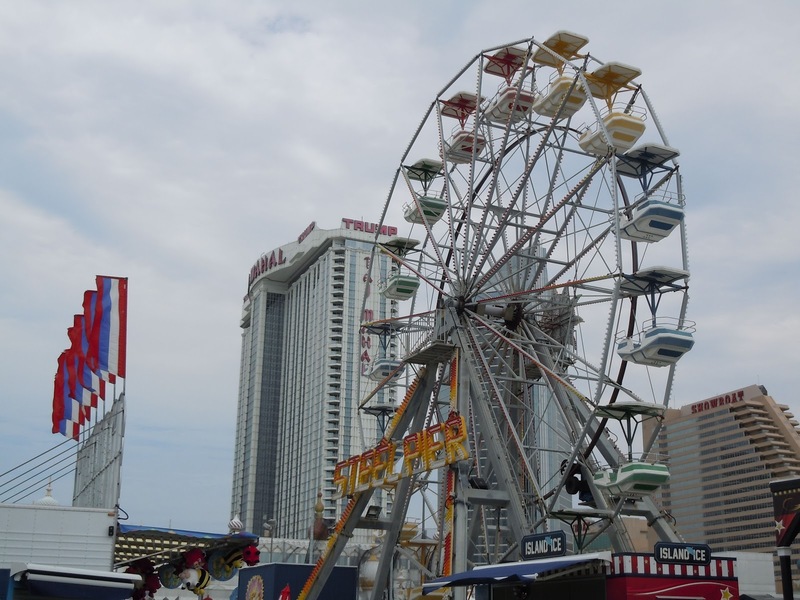 Amusement could also be found several steps away on the Steel Pier, even though it only held hints of its lively past. While there are no longer human cannonballs or diving horses, there still are acts, such as a high-wire motorcycle trapeze act (which we could view from outside the stage area). Nan and I found a water gun squirting booth that for $3 yielded me, the winner, a brand new stuffed animal to bring home to fluffy Sasha. Life only got better when we walked from the pier to Ripley's Atlantic City. Wandering amidst all its oddities, I amused myself with the little quiz questions on panels throughout the museum, such as counting the number of triangles. At times, certain exhibits freaked me out, like the tourist lookalikes (pictured in the photo to the right), eerily true to life. After making it through the entire attraction without too many squeals, I found myself faced with walking in the optical illusion of a rolling barrel in order to exit. I took one step forward and had to run back to Nan, clueless about how I would successfully walk, sick with potential dizziness. Having lost all reason, Nan as always calmed me, telling me to simply close my eyes and hold onto the sides and walk. I did, very quickly, hurrying out to the exit and back into the beating heat of the afternoon, knowing that without Nan there, I would have retraced all my steps back to the entrance in order to exit. 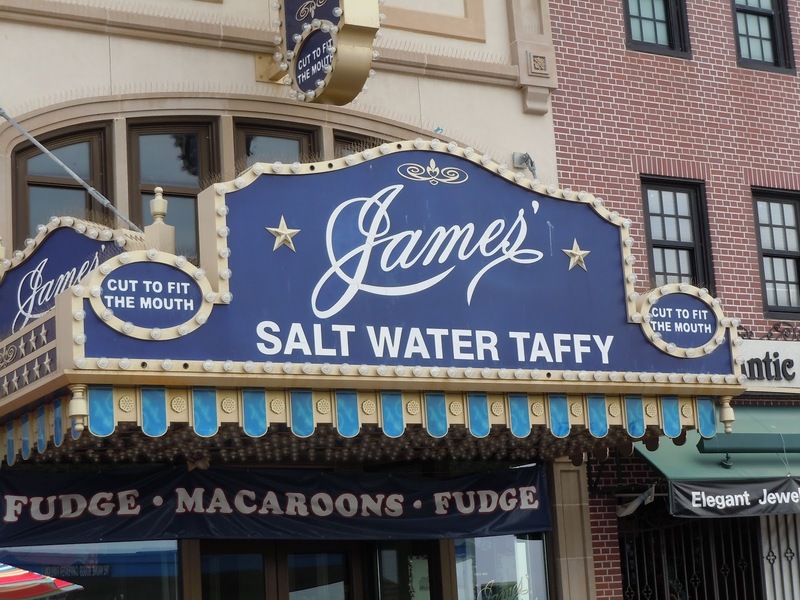 During our two days there, we ate extremely well, even if it sometimes meant a bit of taffy as snacks (ubiquitous on the boardwalk). For our first night, we ventured a couple of blocks from the ocean to the famed Monopoly Atlantic Avenue to Dock's Oyster House, a classic seafood house with more than hundred years of history and fresh oysters. Our meal consisted of a dozen oysters, mostly east coast, and delightfully unfamiliar (Barcats, Old Salt, and Cape May Salts), and a delicious entree of fluke, perfectly cooked so that the white flakes simply fell easily onto the plate, melting in freshness in our mouths. The next evening we opted for the Atlantic Grill, one of the restaurants in Caesars, with a good view of the ocean and a fantastic happy hour. Our food selections included various sushi rolls, calamari, crab cakes, and oysters, all $4-6 less than the cost on the dinner menu, along with a refreshing gin cocktail. And so our days and nights were filled with much more than the mindless games of the casino floors (which we did contribute to at times), making Atlantic City a delightful escape for my eclectic soul. 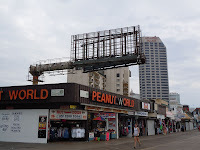 And even though this time I only had the image of Mr. Peanut to stroll along with me, I left the boardwalk with a nostalgic smile. 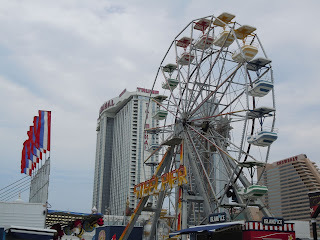 Taking a walk at Atlantic City boardwalk attractions is really a great experience since you can see the amazing people and stuffs there.